Bartolomeo Eustachio was born in 1524 in San Severino Marche, a little town situated in the center of Italy and belonging at that time to the Papal States. He received from his father, Mariano, a physician said to be of noble family, an excellent classical education. 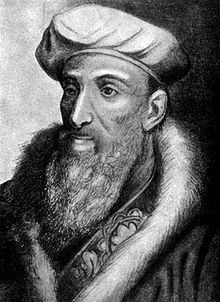 Eustachio’s studies in Greek, Hebrew and Arabic helped him prepare an edition of the Hippocratic glossary of Erotian (1566) and is said to have made his own translations of Avicenna (Ibn Sïnã) from the Arabic. He completed his studies to become a doctor at the Archiginnasio della Sapienza, forerunner of the university of Rome. He started to practice in Ancona, a more influential town close to S. Severino Marche, and soon his skill gave him a widespread renown, that he was chosen as personal physician of members of the powerful family of Della Rovere and in particular of Cardinal Giulio della Rovere. In 1549, Eustachio followed Cardinal Della Rovere to Rome, later; he became protomedico and taught anatomy at the medical faculty of the Collegio della Sapienza. Thanks to his academic position, Eustachio could obtain cadavers for dissection from Roman hospitals of Santo Spirito and Consolazione [1,2]. From this practice he improved the knowledge of anatomical organization of several areas of the body and prepared a series of forty-seven copperplate engravings of anatomical illustrations, assisted by Pier Matteo Pini, an artist living in Urbino. Eustachio published his Opuscola Anatomica in 1564, aimed at including them in a medical treatise. 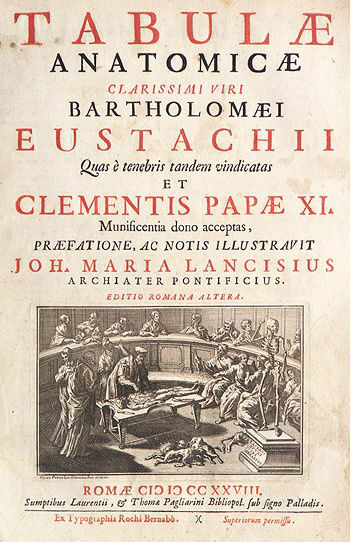 After Eustachio’s death in 1574, his tabulae anatomicae were forgotten in the shelves of the Vatican Library until 1714 when Giovanni Maria Lancisi discovered them. Lancisi was the physician of Pope Clement XI and a successor to Eustachio in the chair of anatomy at the Sapienza. Lancisi appreciated the preciseness and the accuracy of the plates and went on to publish the entire series of forty-seven engravings under the title: “Tabulae Anatomicae Bartholomei Eustachi quas a tenebris tandem vindicatas” (Anatomical Illustrations of Bartholomeo Eustachi rescued from obscurity) (see Fig. 1), . Figure 1. Tabulae anatomicae Bartolomeo Eustachi. 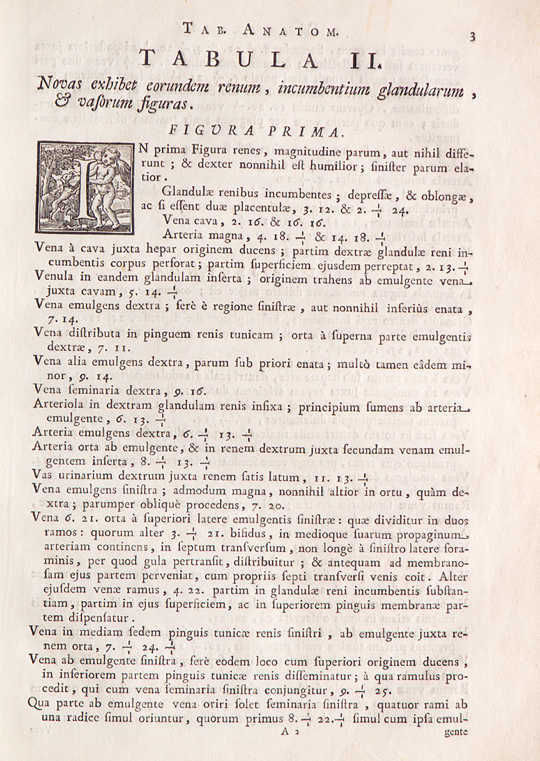 Tabulae anatomicae discovered and published by Giovanni Maria Lancisi. The title page shows an engraving of a dissection. The illustrations were very modern looking, and they provided some of the best descriptions of the base of the brain, the sympathetic nervous system, the vascular system, and the structure of the larynx. Of particular interest was that in 1563, Eustachio’s innovative method of localizing details of his drawings by means of coordinates surrounding the figure had, for the first time, described the adrenal glands, which he termed glandulae renibus incumbents . His original description still holds true today: ” Even if many will consider sufficient what we have said about the surface of the kidneys, somebody could well object that I have neglected something and I consider it indicated to say something of the glands, diligently overlooked [diligenter praetermissis] by other anatomists. Both kidneys are capped on the extremity towards the cava by a gland. Both are connected by a fold of the peritoneum in such a way that one, if he is not very attentive, does not really overlook them, as if they were not present. Their shape resembles that of the kidneys… sometimes one is bigger, sometimes another…” – translated by Lenard , (see Fig. 2). 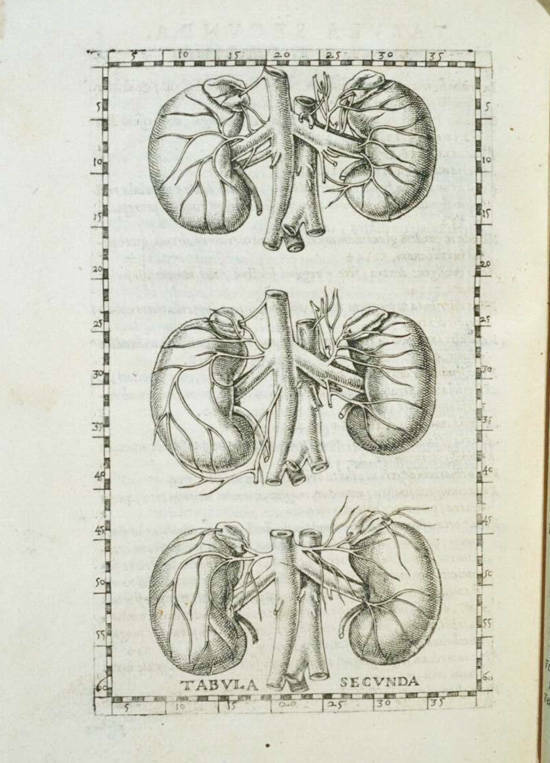 Eustachi’s description of the kidney and suprarenal glands, from Lancisi in 1722, are shown in Figures 3, 4 and 5. But these observations of Eustachio were not accepted by other anatomists of his time. Lenard referred to this era as that of the “fighting anatomists”. In fact, Arcangelo Piccolomini, who belonged to a noble, powerful, roman family and had named the glands the suprarenals, soon attacked Eustachio’s opinions. In 1587, Piccolomini published Anatomicae prelectiones with his own conclusions about adrenals, he wrote: “sometimes one may see two or more glands lying on the kidney, but we do not think they deserve special attention, because they are not to be found in every case and they have no flesh or parenchyma of their own, so that they might be considered renal excrescences. They form part of the renal parenchyma. Why do they exist in a few? The same way supra-abundance of material creates a sixth finger, they originate from a seminal surplus and that is the way they come out of the kidney” [6,7]. Piccolomini was not the only one who had controversy with Eustachio’s conclusions: Andreé Du Laurens, physician of Henry IV of France, stated: “Eustachio claims to find a gland above the kidneys. Sometimes we saw that too; often however we notice that there was not such gland” . Figure 3. Eustachi’s description of the kidney and suprarenal glands, from Lancisi in 1722. The great teachers of the Gymnasium Patavinum, of the famous Padua School of Medicine, established the existence of adrenal glands. Adrainus Spigelius (1578-1625), who called them capsulae renales, in De humani corporis fabrica libri X, wrote: “The glands, described by Eustachio in our times… are half-moon shaped and they resemble the kidney. I think they serve to fill the vacuum, which is situated between kidney and diaphragm and they support the stomach where it approaches veins and arteries of the kidney” . In 1611, Caspar Bartholin (1585-1629) described the adrenal glands as hollow organs, filled with “black bile”, derived from blood circulating from liver and spleen, stored in the glands before the processing by kidneys and excretion with urine . This description encountered the favours of the contemporary main scientists and its greater merit was to relate pathological status to adrenal alterations. Jean Riolan the Elder (1538-1605) and the Younger (1577-1657), among the detractors of Bartholin’s theories, did not believe that adrenals were hollow, and thought that served to sustain groups of nerves above the kidney and, according to Riolan the Younger, to generate perirenal fat in the foetus . It was Riolan who named the glands capsulae suprarenales, a term equivalent to the modern one . It is most unfortunate that Riolan is best remembered as William Harvey”s chief opponent. Riolan’s anatomical concept of the adrenal glands was correct but neither of his observations found acceptance during his lifetime. Thomas Wharton (1610-1673) in 1656 suggested that the adrenals took something from the nerves and secreted it into the circulation, preceded the current neuroendocrine function of the adrenal medulla . Other theories about adrenal functions involved a possible role in reproductive apparatus. In 1719, Antonio Maria Valsalva (1666-1723) described an excretory duct arising from adrenals and ending at the left epididymis, and from the left adrenal and ovary; he wrote.” I think they produce in male and female a liquid which is necessary for fecundation” . In 1716, the Academie des Sciences de Bordeaux headed by Montesquieu, offered a prize for an answer to the question: “Quel est l’usage des glands surrenales?” (What is the importance of the adrenals?). None of the entries was considered worthy of the prize. No theory was judged capable to resolve correctly the problem and the famous philosopher himself, who at that time was 29 years old, said: “le hazard fera peut-être quelque jour ce que tous les soins n’ont pu faire” (Perhaps some day chance will reveal what all our efforts was unable to do). The thought of the day was strongly influenced by the concept that the adrenal glands were hollow. Conversely, in 1805, it was probably Georges Cuvier (1769-1832) who first established that the adrenal glands were solid structures  and Meckel (1781-1833), in 1832, revealed that the apparent cavity was in all probability due to postmortem artefact . It was only at the beginning of the 19th century, with the use of achromatic lenses of the microscope, that it was possible to describe the fine structure of the adrenals. Albert von Kölliker (1817-1905), in 1852, recognized the distinction between cortical and medullary substances from an anatomical and physiological point of view. Kölliker thought that the adrenals were functionally related to the nervous system and he showed that the adrenal cortex is formed first and is subsequently invaded by sympathetic neural elements . These and other studies in the last half of the 19th century clearly established that the adrenal medulla is histologically and functionally separate from the cortex [17,18]. So, at the beginning of the 17th century, the presence of adrenal glands in the human abdomen had been established, but their physiologic role was far from being elucidated. Several physicians in the following decades developed different theories about the function of adrenal glands. This gave rise to scientific discussion, which had been listed for the following two centuries until the time of Thomas Addison (1793-1860). Addison was an English doctor who observed a rare disease with a fatal course, characterized chiefly by anemia, general weakness and fatigue, disturbances in the digestive apparatus, enfeebled heart activity and a peculiar dark pigmentation of the skin. He was able to show that this morbid picture made its appearance in persons the greater part of whose adrenals were destroyed. Addison, in his monograph: “On the Constitutional and Local Effects of Disease of the Suprarenal Capsule” , published in London in 1855, gave the basic contributions to the knowledge of the internal secretion in general and to the part played by the adrenals, in particular, representing the beginning of the study of the endocrine glands. Professor G. Liljestrand, from the Royal Caroline Institute, at the 1950 Nobel prize in Physiology or Medicine (Kendall, Reichstein and Hench, for their discoveries relating to the hormones of the adrenal cortex) presentation’s speech, acknowledged the importance of Addison’s contribution to the understanding of how adrenal glands function. In 1894, Oliver and Schäfer proved that the injection of a watery extract from the adrenals had extremely pronounced effects. Within a few years adrenaline had been produced from the extract, its composition had been ascertained, and its artificial production accomplished. Biedl and others showed that it is the cortex which is of vital importance, not the medulla. Thus the two parts are also different in respect of their functions in the body. It may be said that the medulla and cortex constitute independent bodies, which as a rule are combined in one organ . By the end of the 19th century basic anatomy, histology, and embryology of the adrenals were understood and the discovery of these glands will continue to be an important part of the history of neuroscience and endocrinology. Bilancioni G. Bartolomeo Eustachi. Florence: Istituto micrografico italiano. 1913. Capparoni P. Profili bio-bibliografici di medici e naturalisti celebri italiani dal sec. XV al sec. XVII. Rome. 1925-28. Second edition; 1932. Fine LG. Eustachio’s discovery of the Renal Tubule. Am J Nephrol 1986; 6:47-50. Lancisius JM, Gonzagae F. Tabulae anatomicae clarissimi viri bartholomaei Eustachii qua a tenebris tandem vindicatas. Rome. 1714. Eustachio B. Opuscula anatomicae. Venice: V. Lucchino. 1563-64. Reprinted in Leiden, 1707, and Delft, 1726. Lenard A. The history of research on the adrenals, 1563-1900. J Hist Med 195 1; 6: 496-505. Piccolomini A. Anatomicae praelectiones explicantes mirificam corporis humani fabricam. Rome: B. Bonfadinus. 1568. DuLaurens A. Historia anatomica humani corporis et singularum eius partium multis controversies observationibus illustrata. Paris: M. Orry. 1640. Spigelius A. De humani corporis fabrica libri X. Opus posthumum. Venice. 1627. Bartholin C. Istitutiones anatomicae. Ed. IX. Goslaria. 1632. Shumacker HB. The early history of the adrenal glands with particular reference to theories of function. Bull Johns Hopkins Univ 1936;4: 39-56..
Riolan J. Nomina Anatomica: glandula suprarenalis. (Fifth edition) 1983. Valsalva AM. Opera, Dissertatio Anatomica tertia. Venetius: F. Pitteri. 1740. Cuvier BG. Leçons sur l”Anatomie Comparée. Paris. 1805. Meckel JF. Handbook of General, Descriptive Anatomy and Pathological Anatomy. 1832. Editorial 138. Kölliker A. Manual of Human Histology. London: G Busk and T Huxley. 1854. Carmichael SW, Spagnoli DB, Frederickson RG, Krause WJ, Culberson JL. The opossum adrenal medulla. 1. Postnatal development and normal anatomy. Am J Anat 1987;179: 211-19. Werner B. De Capsulis Suprarenalis, diss ingarg. Dorpati Livonorum. 1857. Addison T. On the Constitutional and Local Effects of Disease of the Supra-Renal Capsules. Baltimore: Williams & Wilkins. 1855. Liljestrand G. Nobel Lectures, Physiology or Medicine 1942-1962. Amsterdam: Elsevier Publishing Company. 1964.